Apple’s latest cohort of mobile devices are not even a month old, and already there are reports of teething issues. The most troubling one comes from an iPhone 8 Plus owner in Taiwan, who claims her device cracked open while on charge. 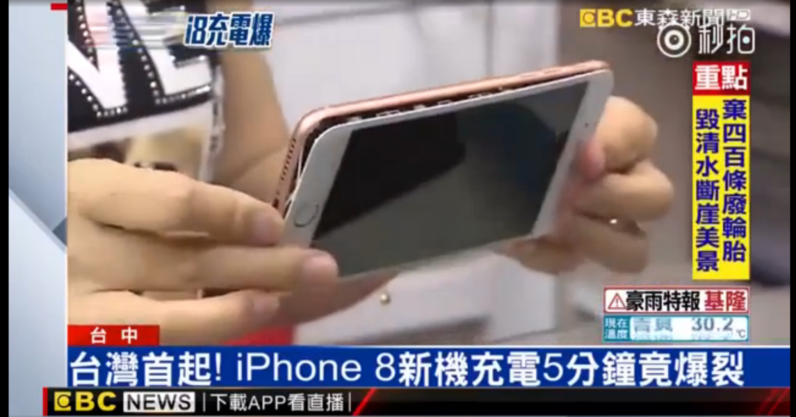 According to Taiwanese and Chinese media, the phone belonged to a Ms. Wu, who recently renewed her phone contract and purchased a 64GB rose gold iPhone 8 Plus. The issue emerged five days after purchasing the phone. Wu placed her phone on charge, using the supplied cable and adaptor. After three minutes, she reported seeing the front panel bulge, and eventually lift completely from the device. According to multiple Taiwanese outlets, the phone was later recovered by the carrier, and has since been shipped to Apple for analysis. Other iPhone 8 Plus owners have reported experiencing similar issues. One Japanese owner claims his phone arrived in a comparable state, with the screen visibly detached from the body. So far, the finger of blame is being pointed at the battery. Unconfirmed reports state the iPhone 8 Plus uses the same battery manufacturer, Amperex Technology Limited (ATL), as the Samsung Galaxy Note 7. But it’s worth remembering a couple of things. Firstly, many of the details surrounding this incident are hazy and unconfirmed. Take them with a grain of salt. Most of all, it’s worth remembering that even if the reports are true, they aren’t necessarily indicative of a trend. It could easily be a manufacturing flaw with a couple of individual devices. Both the iPhone 7 and iPhone 7 Plus had reports of exploding devices, but these were just isolated incidents, and millions of these phones were sold without issue. We’ve reached out to Apple for clarification, and will update this piece should we hear back from them.